GOAL HAWKSFranklin gathers the bouncing ball. He throws it onto his boot and the siren sounds as it goes through. It is a goal and Lance Franklin finishes up with 13 goals. It's all over and the Hawks have absolutely thrashed a very poor North Melbourne by 115 points. GOAL HAWKSFranklin takes possession on the boundary. He cannot surely? YES HE CAN! BUDDY HAS 12 GOALS AND HE FINISHES OFF WITH THE BEST ONE OF THEM ALL! Just a matter of getting through junk time now with both teams ready for the post match Powerades. GOAL HAWKSDrew Petrie hurriedly kicks the ball out on the full. Whos is the closest? It's Puopolo and he kicks a beauty! Surely the best goal of the game and there have been plenty. 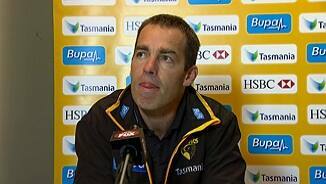 Hawthorn will use this match as a springboard to their recovery after a slow start to the season. North Melbourne have the bye next week and will find themselves 3 matches and percentage out of the 8. BEHIND HAWKSBrad Hill sneaks it in for a behind from 45 metres out. GOAL KANGAROOSWells kicks a good goal from the boundary in one of the only highlights for the team in the blue and white stripes. GOAL HAWKSBreust flies to take the mark on the lead. He keeps getting in Franklin's way! Breust goes back and guides it through. That brings up the 100 point margin with the Hawks leading by 102. GOAL HAWKSRioli runs to the boundary and collects the ball. He thinks about it then goes for the miracle goal. It's not a miracle with Rioli - It's an expectation! What a goal! BEHIND KANGAROOSHarvey tries to manufacture something for North. He runs in and misses to the left. BEHIND HAWKSFranklin makes the intercept, bursts through and kicks it across the face from 30 metres out. GOAL HAWKSFranklin marks on the lead and goes back. He strolls up, takes the Buddy run up and kicks it. He has 11 goals - not something you write very often. GOAL HAWKSBreust bumps Franklin in the contest for the ball, takes possession and kicks a pressure-less goal for the Hawks. North has tightened up early in the last quarter. This match is all over at three quarter timewell it was all over a long time ago! Hawks lead by 84 points. GOAL KANGAROOSWright is paid a soft free kick for a push and he kicks his third goal. Franklin leads North Melbourne by 24 points. Hawthorn have been outstanding this afternoon and based on this performance they are only just warming up and setting themselves to make a huge impression in September. BEHIND HAWKSSuckling's shot at goal from 50 metres out drifts to the right for a behind. North Melbourne supporters can safely book their holidays in September without any need to concern themselves with the AFL Finalsunless they are footy lovers of course. North Melbourne have put up a disgraceful performance in this third quarter. A team that claims to be on the rise has certainly come crashing down and their season is in absolute tatters. BEHIND HAWKSFranklin marks 48 metres out. This time it starts left and stays left. GOAL HAWKSHale has it 35 metres out and he looks determined to kick the goal. He guides it home with the Hawks advancing to an 88 point lead. GOAL HAWKSSmith marks it deep in attack. The North Melbourne defence sit there and admire him and he turns and kicks his first. GOAL HAWKSFranklin takes yet another mark and he is at his best today. He kicks goal number 10 and runs off to the applause of the crowd. BEHIND HAWKSFranklin is held by Thompson, but he hooks the shot to the right. He has kicked 9.3. BEHIND HAWKSSmith runs inside 50 but sprays his kick to the right. GOAL HAWKSFranklin stands tall 40 metres out and kicks his 9th goal. 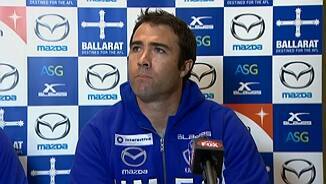 This is Buddy's Day and it is certainly not North Melbourne's day! He is beating them by himself! GOAL HAWKSPuopolo centres it soccer style to Lewis for the tap in. Hawks are smashing them and the Kangaroos have been reduced to witches hats. GOAL HAWKSNorth's defence is cracking under pressure. This time Young tackles Firrito and kicks the goal from the resulting free kick. This is a Hawthorn avalanche. They lead by 55 points. GOAL HAWKSNorth turn it over with a bad handball deep in defence. Franklin soccers off the ground and he kicks another goal. He has goal number 8. GOAL HAWKSFranklin is held without it and is paid the free kick. From the boundary he kicks his 7th goal and the Hawks are already over the line here. The siren sounds for halftime with the Hawks well in control of this match. They lead by 37 points. GOAL HAWKSFranklin tackles Thompson who takes him on and he is pinged. Franklin goes back and kicks goal number 6. Hawks are on fire. North Melbourne needs to add at least another goal without conceding any themselves. GOAL KANGAROOSEdwards is pushed out and from the free kick he sends it to Wright who takes a good strong mark. From 35 metres out he kicks it to keep North in the match. BEHIND HAWKSPuopolo is taken high, but his shot from the boundary misses to the right. GOAL KANGAROOSWright ends Hawthorn's run of 9 consecutive goals with the deficit reduced to 35 points. 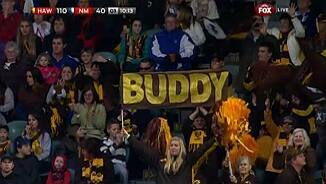 GOAL HAWKSIt most certainly is Buddy Day all over again. The big man has 5 after marking ad slotting it through and the Kangaroos are in deep gravy. GOAL HAWKSRoughead marks it in the pocket. He plays on and kicks the banana goal. He celebrates like the Hawks have just won the grand final! BEHIND HAWKSFranklin takes another mark 30 metres out near the boundary. This time he sends it to the right. 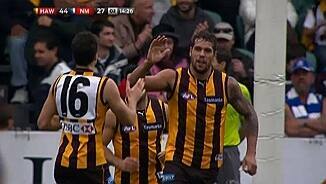 GOAL HAWKSRioli bursts through the middle once again. He is killing them at the moment! He kicks long to Breust who marks and slots it through from point blank range. GOAL HAWKSFranklin nudges Delaney out of the way. He marks overhead and turns around. There is nobody hanging out so he decides to go for a stroll and kick another goal. Hawks by 23 points. GOAL HAWKSHawthorn win yet another centre clearance and it's inside 50 very quickly. Franklin takes it and he won't handball. He does it himself and kicks the goal. GOAL HAWKSHale marks the kick in and he sends a long kick to the lead of Franklin who marks it low. From the 50 he has no trouble kicking it. Hawks by 12 points. BEHIND KANGAROOSHarvey runs inside 50 and short passes to Greenwood on a worse angle. Greenwood lines up and squeezes it in for a behind. Hawthorn kicked the last three goals to lead by 7 points at quarter time. GOAL HAWKSHawks win another clearance and here comes Franklin. It was Buddy Day yesterday and Lance is hoping it extends by another day. He marks 25 metres out and kicks the goal. GOAL HAWKSHawthorn win the clearance through Burgoyne. 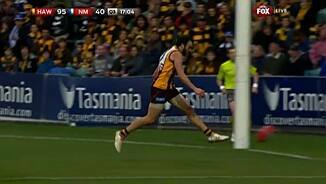 He juggles it and then handballs it off to Rioli who continues running and pulls the trigger. It's a goal allright! GOAL HAWKSSmith bursts through the middle with pace. He handballs inside to Young who takes them on and kicks the goal from the 50 metre line. BEHIND HAWKSGoldstein waits for the ball to roll out of play but Lewis gets underneath and sticks his boot at it. Fortunately for Goldstein it rolls through for a behind. GOAL KANGAROOSFrom the bounce, Petrie gets it down to Wright who finds Adams outside. Adams snaps it high, but more importantly it is straight! Goldstein has been good in defence, already taking 3 marks as the loose man in defence. GOAL KANGAROOSShiels fumbles and the ball is turned over. A sub standard tackle by Puopolo allows Atley to kick from the 50 and watch it bounce through. Kangas in front. GOAL KANGAROOSPetrie flies to outmark two Hawthorn defenders. From 30 metres out he opens up the angle and levels the scores. The Sherrin is a fiercely contested commodity at the moment. GOAL KANGAROOSMacMillan kicks long from the 50 where Edwards marks it at the edge of the square. He runs around and kicks the goal and the Roos are on the board. GOAL HAWKSLewis, the acting captain, leads in the pocket and takes it on his chest. His kick could not have been any better from 45 metres out on a 45 degree angle. Hawks have started well. BEHIND HAWKSShiels tries to conjure up something special, but his effort misses to the right. GOAL HAWKSThe ball is in dispute in the goal square. It spills out with Puopolo running onto it and kicking it through from the tightest of angles. Puopolo does a West Coast Eagle impersonation and wins the free kick for a high tackle. His poor pass that misses the target is a just outcome. BEHIND KANGAROOSGreenwood's long range shot at goal misses to the right to get the scoring underway. We are off and underway Tassie style. Welcome to Launceston for North Melbourne's visit as the away team to take on the hosting Hawks.